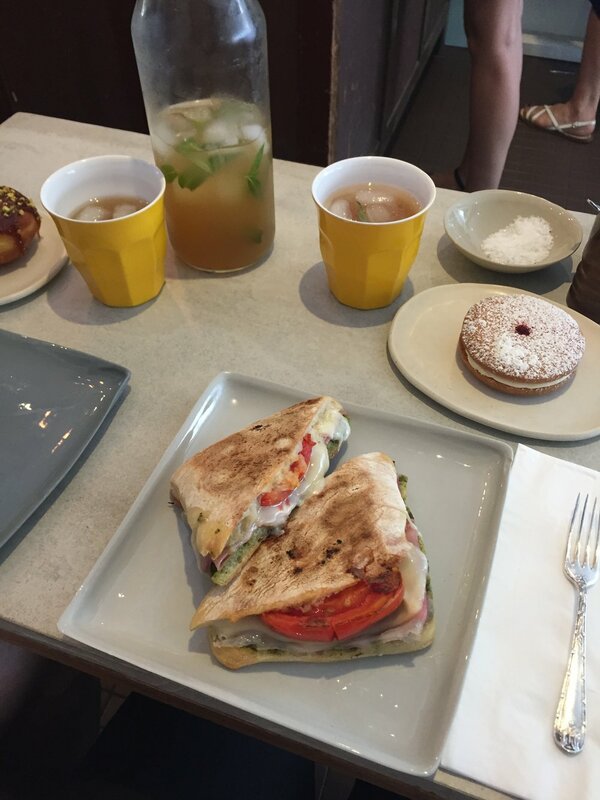 This iced tea is based on one served at the Sydney baking institution, Flour & Stone. Earlier in the year a friend and I spent the day in the city, wandering around the shops and stopping in at Flour & Stone for lunch. Lunch was delicious and we also ordered a carafe of their Ginger Snap Iced Tea to share. It was so nice, it immediately had me wondering how I could recreate it at home. The ginger snap element comes from Rabbit Hole Tea’s Ginger Snap tea which is caffeine free. The Rabbit Hole Tea bar in Barangaroo also serves a great iced version of this tea - the Ginger Snap Iced Latte. This is my go to when I visit Rabbit Hole, and if you make extra concentrate of the tea you can keep it in the fridge and pour over milk and ice to make one at home. Iced teas like this one are extremely welcome at this time of year, especially with this heat wave we are experiencing here in Sydney at the moment. I also think it would make a nice caffeine free and alcohol free drink for New Years celebrations and Summer get togethers too. I often like to have a jug of this in the fridge and take some to work in one of those metal tea flasks that keep drinks hot or cold for hours, so I can enjoy a nice cold yet tasty drink while I’m at my desk. In a large jug (at least 2 L capacity), brew the tea in about 500ml of warm water. Leave for at least an hour (or longer if you want a stronger taste). Strain the leaves from the tea and allow to cool. Once cooled, mix in the cloudy apple juice, passionfruit pulp and most of the mint leaves. Top up with chilled water and ice. Serve each glass with extra ice and an extra mint leaf or two. It will keep in the fridge for a few days, and the flavour develops amazingly over the first day, so if you have time make it the day before you wish to serve it. This recipe came about when I wanted to use up some passionfruit leftover from the sponge cake I made a little while ago. I do find it funny that whenever we have leftover or almost over ripe fruit in the house we use it to bake with! We’d probably be better off just eating it, rather than adding sugar and butter to it, but that wouldn’t be as much fun though would it? The base of this loaf cake is one I use often for cupcakes and whole cakes as well. It is quite versatile and has featured on the blog in the past in different forms. You can substitute the margarine for butter, the golden caster sugar for caster sugar, and the buttermilk for regular or skimmed milk. You can even use vanilla extract if you don’t have any vanilla bean paste. This loaf cake is that easy - you don’t even need to have all the right ingredients for it to be great! I apologise if anyone is throughly sick of seeing recipes for cake that involve passionfruit from me. Unfortunately, when there is something I like, I keep using it! And when I get an idea for a cake or recipe, I find it hard to think of anything else until the idea has been brought to life! So be prepared for a few more slightly repetitious cakes in the next little while! All of which however, can be altered to suit your tastes or what you have available. This loaf cake for example, would be just as good using lemon juice in the icing. On another note, the size of the loaf cake my look a little deceiving in the photos. This is because about half of it had already been eaten by the time I could take photos! Beat in the eggs one at a time, then add half the flour and half the buttermilk and mix. Add the remaining flour and buttermilk and mix on medium speed until well combined. Transfer the mixture into the loaf tin, smoothing the top. Bake for 1 hour, or until the cake springs back when touched lightly and a skewer comes out clean. Once the loaf has cooled completely, sift the icing sugar into a bowl. Add the pulp of 3-4 passionfruit gradually, mixing after each addition. Stop adding pulp when the icing is a nice smooth consistency. Drizzle the icing over the cake, allowing it to fall down the sides. Leave for 2-3 hours to allow the icing to dry before storing in an airtight container, or eat straight away! January 26th. I’m not sure what it means for you, but for me, it’s a legitimate excuse to bake. I think baking is the only way I celebrate holidays really. Maybe you noticed my (almost) excessive baking over Christmas? Food is a great way to celebrate a holiday and bring people together. And most of the time, holiday baking means making something you only make at that time of year. Which seems to make the whole process more special. For Australia Day, I think Lamingtons are the best choice. Pavlova comes a close second, though I couldn’t bare only making a Pav once a year, so it happily sits as my go-to dessert all year round. Here are a couple of Pavlova recipes I have made in the past year that would be great to celebrate Australia Day - My Grandma’s Pavlova & My Epic Christmas Pavlova. For those reading who don’t live in Australia, a lamington is made using sponge cake and coating it in chocolate icing and coconut. I think they came about at some point to use up day old sponge. They are definitely worth a try! Sometimes they are sold with a layer of jam and/or cream in the middle as well. I like my lamingtons simple, with no cream or jam. Just made with good ingredients, and probably fresh sponge! Day old sponge is great to use, I just find fresh sponge easier to work with when coating them in the icing. This particular recipe comes from my favourite Aussie cook, Bill Granger. I have made them a couple of times before and they have been very popular. I have altered the quantities of chocolate in the icing recipe, as I like the combination of milk and dark chocolate together better than just dark chocolate on its own. You can use whatever you like or have at home, just keep the total chocolate quantity the same. Any type of coconut can be used to cover the lamingtons. I really like using coconut chips, however if you can’t find them just use shredded, desiccated or flaked coconut. Also, make sure you have more coconut ready than the recipe indicates. I always find I am grabbing more handfuls of it out the bag when I am decorating the lamingtons. It’s probably just because it’s quite messy and I end up with lots of coconut all over the bench! I try to work quite fast when decorating the lamingtons, as the chocolate will start to set before you have used it all up. You also need to get the coconut on each one straight after it has been coated in chocolate so it will stick. Keep stirring the icing to prevent it from setting, and if you need to thin it out a little to make it more liquid, you could a little more milk or some hot water (1 tsp at a time). The icing should be a little thick however, as it will coat the lamington better than a thin icing. What will you be baking for Australia Day? Let me know in the comments below! Pre-heat oven to 180 degrees Celsius and grease and line a lamington tin (rectangle tin with dimensions approx. 18 x 28 cm and about 4 cm deep). Beat the eggs in the bowl of an electric mixer on medium speed for about 5 minutes. The eggs should become light and fluffy in this time. Gradually add the sugar and beat until the mixture is thick and the sugar has dissolved. Sift in the flour and gently fold into the egg mixture with a metal spoon. Add the melted butter and hot water and gently stir to combine. Pour the mixture evenly into the prepared tin and bake for 30 mins, or until the sponge is golden and springs back when lightly touched. Once cooked, turn the sponge out onto a baking paper lined cooling rack, and allow to cool completely. Once the sponge has cooled, cut into squares (about 15-16). Place the coconut in a large shallow bowl, and have four forks ready. You will also need another baking paper lined cooling rack to place the freshly iced lamingtons on to dry. To make the icing, heat a sauce pan with a little water until it is simmering. Place all the icing ingredients (not the coconut), in to a heatproof bowl or saucepan that will fit on top of the saucepan of simmering water. Place the bowl with the ingredients over the simmering water and stir continuously until all the ingredients have melted and combined to form a smooth thick icing. Do not allow the simmering water below to touch the base of the bowl above, as the chocolate may burn. Remove the icing from the heat. Using two of the forks, dip one of the sponge squares into the icing. Using the remaining two forks, toss the chocolate coated sponge in the coconut, and place on the prepared rack to set. Continue with the remaining sponge squares, stirring the icing occasionally to stop it setting. Leave the lamingtons on the baking paper lined rack until the icing dries. They are best eaten the same day they have been made, however will store in an airtight container for a couple of days (in the fridge if the weather is particularly humid or hot). Recipe originally from Bill Granger ‘Everyday’ (Murdoch Books, 2006), p.192.